Do you remember that episode of Seinfeld when George Costanza finally has to come to terms with his Holiday heritage? It all comes to a head with his father proudly revealing that while other families celebrated Christmas or Hanukkah, the Costanza family celebrated their own unique holiday. Festivus. And out comes the ‘Festivus’ pole! The person holding the pole gets the opportunity to air all of the grievances they have against the people in their lives. Well my friends, I too have become a ‘Festivus’ follower. I’m holding the ‘Festivus’ pole in my hand and I’m ready to air my grievances. You ready? Here we go! 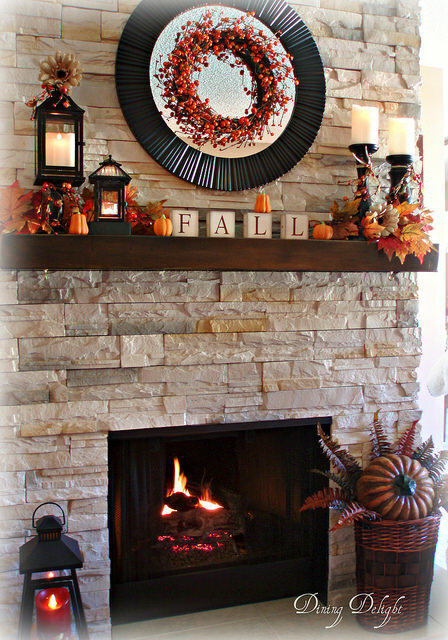 On a warm day in early September I was purusing Pinterest for some Fall Mantel Decorating ideas. And after looking through hundreds of photos, I realized something. There were no dark wood mantels. Everything was white, white and more white. 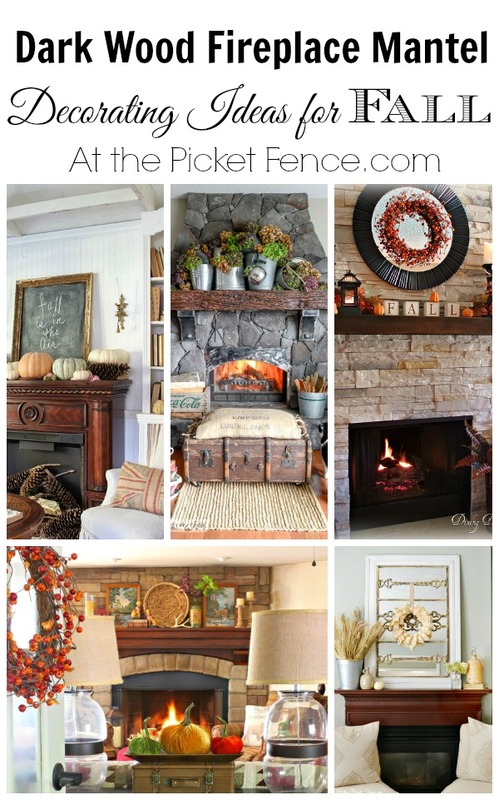 I hopped over to some of my favorite online magazines to look at their round-ups of fall mantels and again, all white. Slide show after slide show of beautiful fall mantels and not a single one included a dark wood fireplace. ‘Dark Wood Fireplace Mantel Festivus For the Rest of Us’! Because, I can’t be the only one who has a mantel in their home that isn’t painted white. In fact, I know that I’m not! And I thought that if I’m feeling a little bit left out, maybe you are too. And maybe you really like your dark mantel. Maybe you don’t want it to be white. 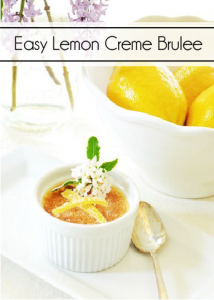 And maybe you would like some inspiration and ideas just for YOU! You see, I love a white mantel. Really I do. But isn’t there something so rich about that dark wood? So warm and so cozy? It can allow you the opportunity to create wonderful contrasts. 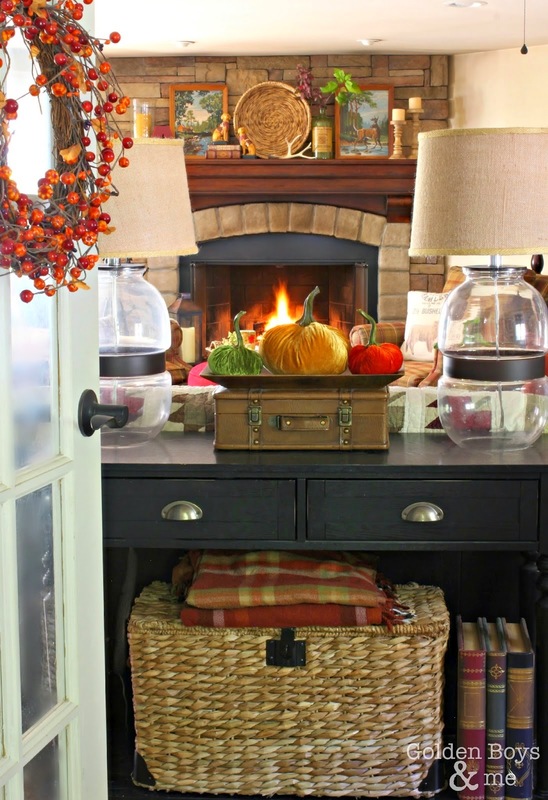 You can enhance it by adding layers of neutrals like I did on my own fall mantel this year. You can pile it high with all of the best elements from nature and give it the opportunity to really stand out in a room that is predominantly white like Courteny from French Country Cottage did with her fall mantel. Or you can add subtle contrast and texture using pieces that truly capture the warmth of the dark wood like Courtney from Golden Boys and Me. You don’t always have to go with lighter colors against a dark mantel. Using black with the pops of orange like this mantel from Dining Delight proves that you don’t have to hide the darker tones but can celebrate them instead. Using metal to create some shine, Donna from Funky Junk Interiors captures the beautiful grain in her wood mantel and then enhances it all with the overflowing texture of dried hydrangeas. And it looks like the kitty approves! Won’t you join me in celebrating the ‘Dark Wood Fireplace Mantel Festivus for the Rest of Us’? Oh and one more thing! 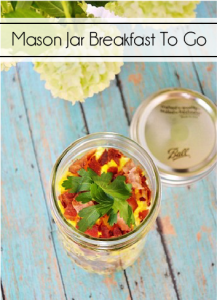 We are so thrilled to be featured today over at Porch.com! Come on by and visit us there! 49 Comments on "When You Don’t Have a White Mantel"
Dark mantles are beautiful. I actually think hey are more appropriate for fall decorating. Long live dark mantles! I also have a dark mantle with a large brick fireplace from floor to ceiling. I love decorating it. This time of year with the oranges and yellows of fall it is gorgeous. Thanks for the ideas. Oh Vanessa, I have to laugh, because I LOVE dark wood, especially mantles, but last week I made one from a door and my husband said it needed to be white so there was contrast with the dark wood it was next to. After I picked myself up off the floor, I painted it all white. Me — the only dark wood loving person left on the planet, or so I thought. Yours looks beautiful!! You are so right, my friend. I look at Pinterest too and it seems EVERYONE has a white mantel. Me and my beautiful dark stained, custom mantel, that I designed and had stained dark, feel out of place and not so beautiful. I’ve even considered painting it – which I think would cause a divorce in our house if I even spoke those words out loud. Thanks for reminding me how beautiful our dark mantels actually are. Count me in for the mantel Festivus celebration. Lol this made me laugh! I often feel left out because my home is small and a ranch style blah blah blah instead of a cute, 2 story vintage retro cool house haha. Trends do come and go so we have to embrace what we have and make it beautiful. Love the dark wood especially with fall and winter decorations. It’s so warm and welcoming! Thank you Vanessa for this post! I am definitely celebrating with you! I also looked to pinterest for mantel inspiration and saw white white white everywhere! I have a Fruitwood stained mantel and crown molding in my family room. There’s no way my husband is going to paint it. Not gonna happen. There will come a day when everyone wishes they didn’t paint all that pretty dark wood! Thanks for the decorating photos for dark mantels! I forgot to ask you. What color did you paint your walls? My room faces west and it’s not a bright room until later in the day. I’m having a hard time choosing a paint color. Thanks Vanessa. Awesome post! In a perfect world, I could press a button and have a dark mantel in the Fall when I want warmth and cozy and white in the summer when I want the light and bright! 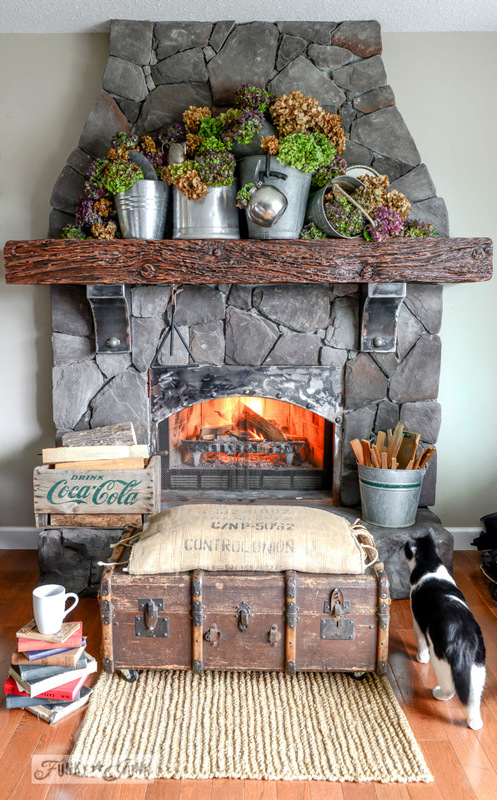 Alas, I don’t … sooo, this post is making me have dark mantel envy, for sure! I used to have dark mantel…and I adore them….I love all of the mantels you featured!! !….I will definitely sign the petition to bring back the dark mantels…and the kitchen cabinets too!…..You always dress your mantel so beautifully!!! Hahaha – I needed a laugh. This is great and your mantel is gorgeous, girl! Hi! I’m right there with you. I have a dark mantle as well as woodwork throughout my home. I dream of white woodwork but as someone else said, the hubs is NOT a fan. I love all the historic features of our home tho and have decided I will just work with it. Thanks for the dark wood love! While I applaud your stepping forward in defense of your mantel, I ask that you also consider another aspect of this conundrum. That would be those of us who have NO mantel to decorate. Definitely an unrecognized minority, we. As if that isn’t enough, I also have two front doors. To match or not to match. Woe the me of this holiday decorating thing. We loved your post and interview guys! Everyone over here in the Porch office is now officially a fan. Love the inspiration and love festivus! lol! My mantel is a medium oak but I have been thinking (now don’t shoot me) of painting it white! Sorry – but I do love the dark ones…just not mine! And I am a HUGE Seinfeld fan – so Fesitvus for the Rest of Us! Too funny! As I was reading your post, I thought to myself, I have a dark wood mantel and I DON’T wish I had a white one and low and behold…you had a picture of MY mantel! I’m honoured that you chose it to use as one of your examples. While I agree the dark wood mantel looks great in fall, it is spring decorating when I find it a challenge. That being said, I love it as it is and will just say “Happy Festivus”! Great post! LOL! Lori did you get the email I sent you?? I wanted to make sure you were ok with me including your mantel. 🙂 It’s so beautiful! Your mantel looks beautiful, Vanessa! 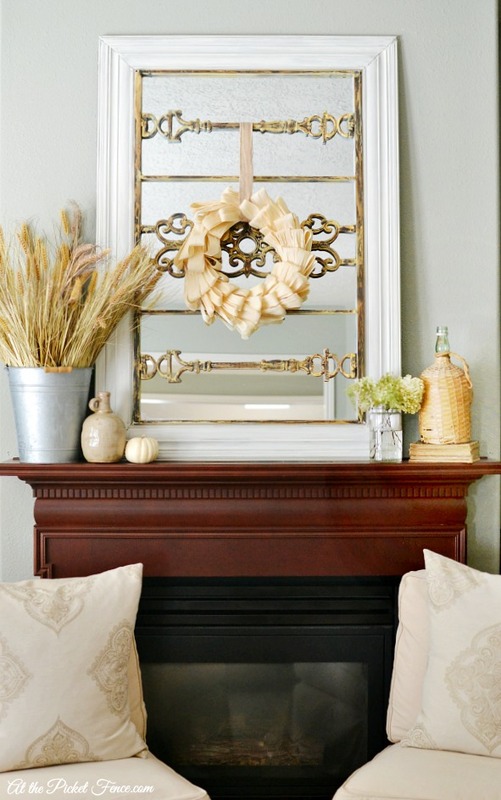 Yes, a dark mantel certainly looks more Fall-like, warm and cozy. I had the dark mantel on two fireplaces in our old house. We have a white one in our current home. Both styles seem to suit the homes they are in; we had a lot of stained wood in our old house and here there is a lot of white (trim, doors). Thrilled to be celebrating Dark Wood Mantel Festivus with you, Vanessa! Thanks so much for including our family room mantel among the other gorgeous mantels. Ohhh I LOVE DARK WOOD! Good for you! 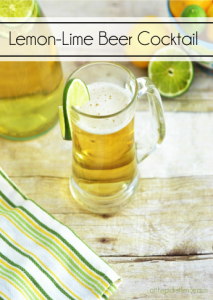 I love the inspiration and will definitely incorporate your tips – THANK YOU!! Ladies, I am so envious of your mantles! They look fab! Dark or light I just miss having one so much! I love how now you can no add a mantle to a room even without a fireplace, I just need to reconfigure the design of my family room to add one! What do you ladies think about that? And by the way Seinfeld…did you ever see the one with Elaine dancing…sorry, I know I am getting off track here but with your post it is just bringing back memories! Mine is similar to Donna’s…. stone with a railroad tie. Once I found some inspiration for it that’s how it stayed, think it has been the same for 2 years now. The white is so very pretty, but the stone is rustic and the railroad tie is architectural. And I can’t see the dust. This post comes at the perfect time for me. I have NO mantel on my beautiful stone fireplace. That simply just won’t do! I knew white wouldn’t work there but just didn’t know what I wanted there. Now I DO! The Dining Delight mantel is exactly what I have. And I love her mantel! That’s for the post! Pinning! 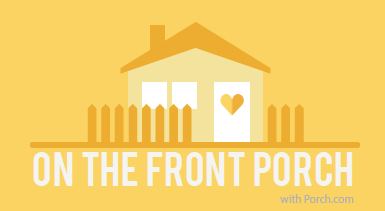 Love your pretty dark wood mantel and the other inspirational images! I agree, adds lots of warmth! Your mantel is gorgeous. 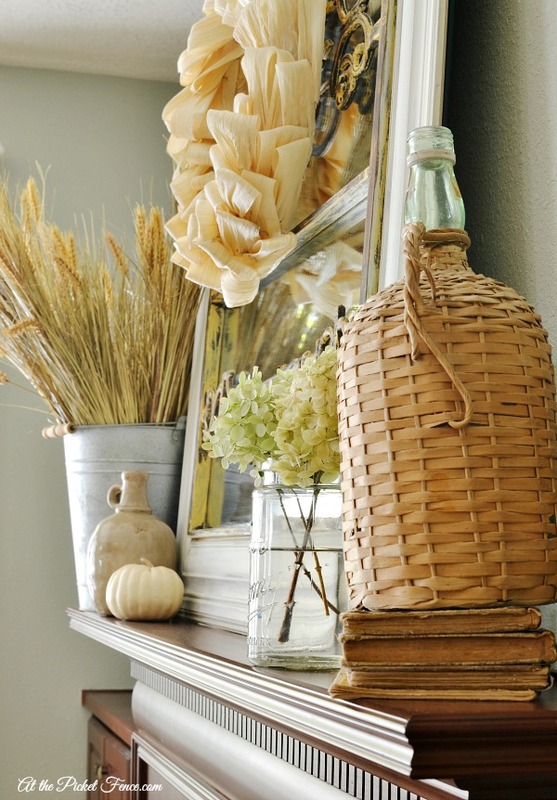 I love how you added texture with the grey metal bucket, glass jar, woven basket and old books. Beautiful wood is always classy, it may not be the latest “trend” but who wants to only decorate based on what is most popular out on Instagram? I miss having a mantel and decorating it for each season. Thanks for sharing these photos of beautiful dark mantels with us! Great tips and ideas!! Those mantels look amazing! Vanessa – I think I am the only person that has never watched an episode of Seinfeld! But I agree with you that dark mantels are beautiful with their rich warm texture and they are perfect for Fall vignettes! Oh my goodness you are cracking me up because I have always longed for a white mantel, well a mantel at all would have worked for me too. Annnd guess what, our new home has a.. wait for it… dark mantel 🙂 I’m actually loving it. Glad I’m not the only one around here! It’s good to be different! I love your dark mantel inspiration. You’re so right … white mantels everywhere. I love it!!! Probably because I decorated with white accessories this year. I don’t have a mantel but I have an almost black piano and it really allows for some great contrast! My kids often joke I want everything white but I love a good dark piece too!! Just wait, I’m sure were on the swing to everything natural wood now that it’s all white. lol. Hey you’ve gotta do what you love. Your dark wood is lovely. Love your dark wood mantel!! All that harvest texture, layers and heights you gave your fall decor is so beautiful! Happy Fall!! Love the dark mantles actually I wish I had a mantle any color would do!! bBeautiful Post! I have a dark mantel, AND I have dark kitchen cupboards! There is a definite warmth in that lovely dark wood. My mantel and cupboards were handcrafted by Amish cabinet makers, and they not only look great, they feel wonderful as I run my hand over them. This is a great post, and right up my alley! We, too, have dark wood in our living room. All decor ideas seen in magazines, on Pinterest, in decorating books, in the movies, in catalogs & sales circulars….ALL white!!! I was beginning to think we were the only people left in America with dark wood! While I think I do a pretty nice job of decorating it season after season, it’s always nice to see more out there. It’s liberating!!!!!! Terrific post! Hope you’re having a Happy Halloween! Yes! Yes! YES!!! I am so happy to hear I am not alone! A few weeks ago I did the exact same thing. 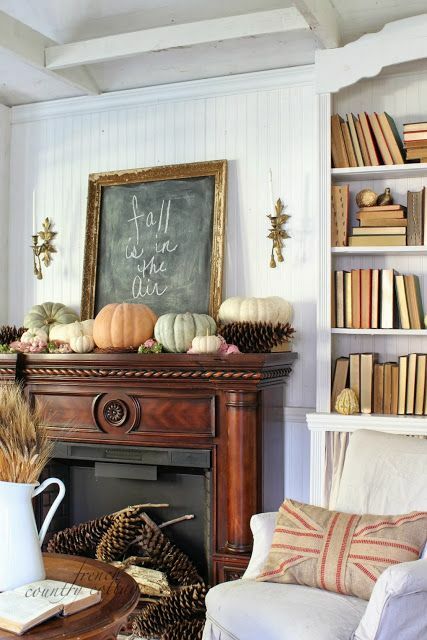 Looking, loving and admiring all the beautiful fall decor all the while noticing all of the white mantels. For a brief moment I even considering paining mine *gasp*! Thanks you for the post and inspiration!